International Alhijamah Therapist Association - www.i-ata. org - is a disease affecting 20% of patients with viral hepatitis and the remainder in the case of blood transfusion. Incubation for 14-182 days, averaging 42-49 days. SYMPTOMS Most people do not have acute symptoms. 20% had jaundice, 30% experience flu-like symptoms. Experience swelling of the liver. Diagnosis Asked if it found the symptoms of hepatitis virus it will do a blood test to confirm the diagnosis and the type of virus. In the event of chronic hepatitis, it is advisable to do a biopsy. Treatment Standard therapy used is a combination of pegylated interferon alfa (PEG-IFN alpha) and ribavirin. Patients with chronic HCV genotype 1 has a weak response to treatment that is given to 12 months of therapy, whereas patients with HCV genotypes 2 and 3 are given adequate therapy is not only just 6. For patients with acute HCV infection are given treatment for 6 months. 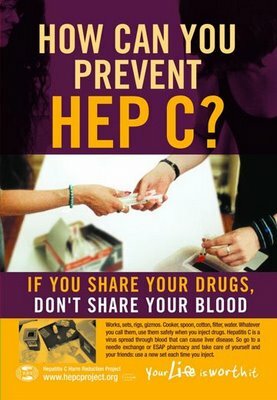 PREVENTION There is no vaccine for hepatitis C. The way to prevent is to reduce the risk of exposure to the virus is to prevent needle sharing behavior or personal tools such as toothbrushes, razors and nail clippers with an infected person.